Creating simple fall flower arrangements for your seasonal home is as easy as looking in your own backyard. The garden is aflame with its bursts of greens, golds, oranges, purples and red fall foliage. I encourage you to take note from nature as it displays the perfect palette for fall floral arrangements. What makes up simple yet elegant fall flower arrangements? I think a good arrangement starts with a concept and is all about experimentation. Don’t be confined to what your eye has been trained to think a good arrangement should look like. Be bold and have fun. Think about this, our society is slowly heading to a place where we are most comfortable when we are told what works and how things should look. When we use common flowers it limits our creativity because our brain is already expecting a particular outcome. Be bold and think like an artist. I encourage you to instead think about being bold and arrange your floral arrangements using different types of flowers found in nature, not the popular flowers found in a local big box store. 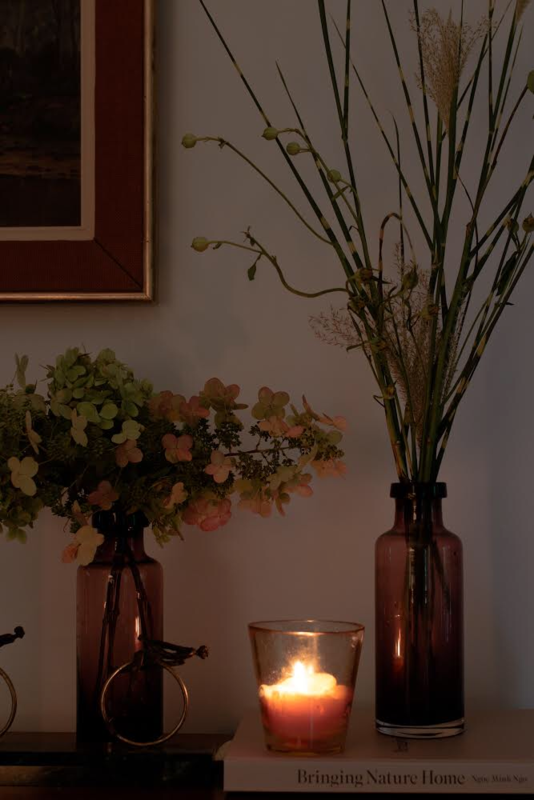 Go for a country walk look for textural grasses or twigs and branches that can easily be incorporated into a nook to create a beautiful still life display in your home. 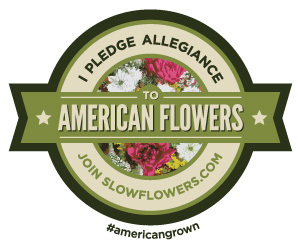 My goal for writing this blog post is not a “how-to” but rather to encourage artistic expression for designing flowers. Beautiful flowers and green foliage are a pleasure to bring into the home. When we perceive the beauty of each bloom as a treasure we instinctively connect to a moment in time. 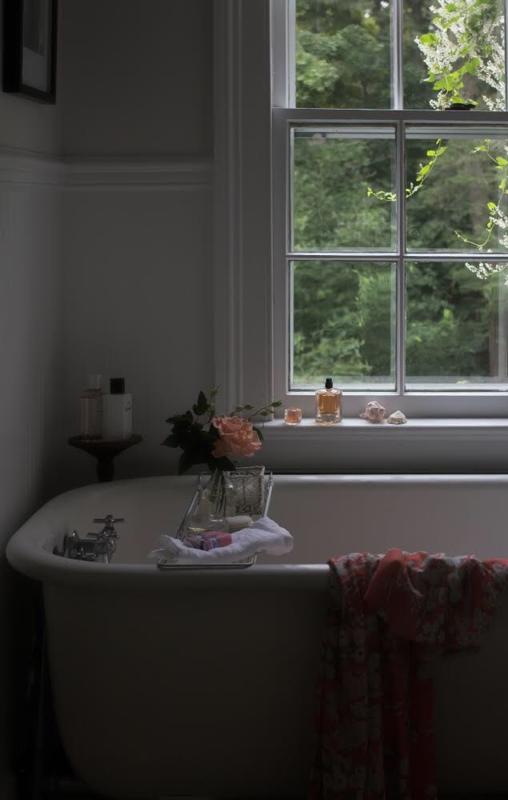 When we decorate our homes with nature we imprint that present moment with a connection to mother earth that pulls us towards beauty itself. Flowers aren’t just a frivolous decoration for our homes, they add to the atmosphere and more importantly, they encourage us to think deeper about our planet and nature. How to capture the essence of the fall season with flowers. Be bold and extraordinary when looking to capture the fall seasonal harvest vibe. I find inspiration for my flower arrangements from my garden and it’s wild overgrown state. Though it lacks the best flowers right now for “flower” arrangements. I’m encouraged by the unexpected wild and dramatic overgrown appearance of the garden. It’s dynamic untidy exuberant feel and floppy gestures encourage the unexpected in my floral design. As I just mentioned earlier, the fall season is not known for its prolific garden flowers and I feel that fall arrangements can be easily made using the deep jeweled tones found in foliage. Growing foliage to be used as the focal point in an arrangement is just as important as growing flowers. Nature encourages us not to become fixated on how specific we are at arranging fall flowers, but rather allows for spontaneity in our floral designs. 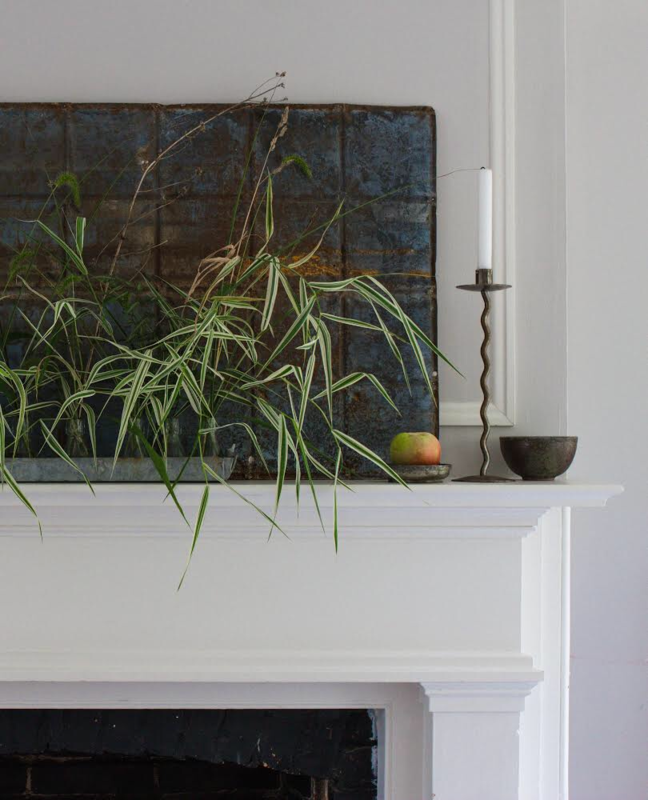 For example, here I gathered floppy feathery grasses placed them in bottles and dramatically changes the mood of this country mantel into a dynamic modern focal point. Use bud vases for a dramatic visual impact. Here are some ideas easily adaptable using a single flower delighting the eye and encouraging us to look deeper into each specimen. Group fall foliage and flowers with collectibles to create beautiful fleeting contemplative still life moments in your homes. I continuously seek out vintage glass bud vases as their quality is superior to those that are machine-made. A single rose from the garden clinging to life while it flexes its exquisiteness, and intoxicates us with its beauty. Leaving us with the everlasting image of perfection of a season gone by. It is a snippet of charm and breaths beauty into even the humblest of rooms. I’m very interested in creating drama using geometric shapes with lines and negative space. Here I’ve cut back grasses which can be easily left in their interesting containers for weeks on end to enjoy. Cut stems of hydrangea fill a big glass vase place them on the floor of your entry and nothing says more than welcome. I’ve shown you how I design flowers using autumnal flowers and that nature is one of my greatest sources of inspiration. In my mind, anything goes. 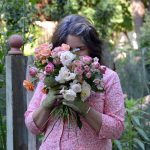 Season after season the garden teaches me how I can further explore and use garden flowers for all of my flower arrangements without hesitation. Use Tones, textures, and height to create interesting displays in your home or party. 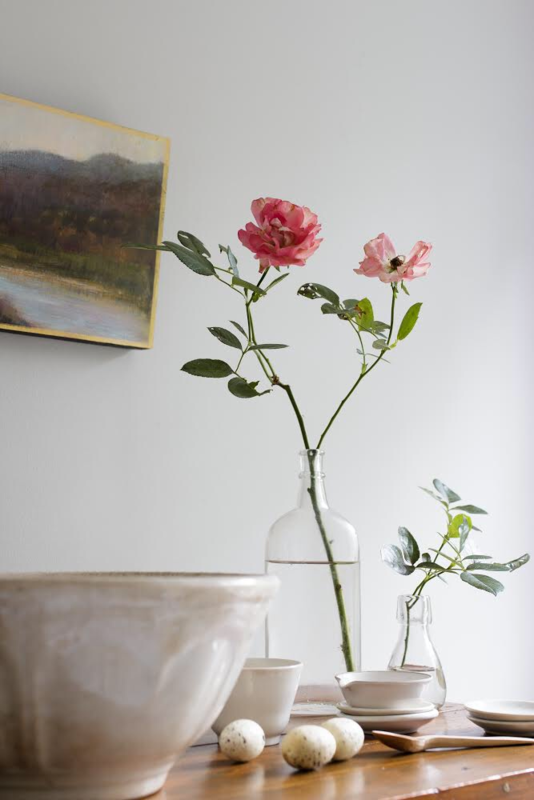 Use old worn cherished and aged vase to display your arrangements. Display vintage-china and bowls outside of your cupboards for decorative moments. Use personal still life moments with old vases vintage ribbons, seashells, tools, flowers or any collection to create your own personal moments in your home. Have fun and play around with all your collectibles along with the autumnal flowers and seasonal foliage you find to create beautiful displays in your home or party.